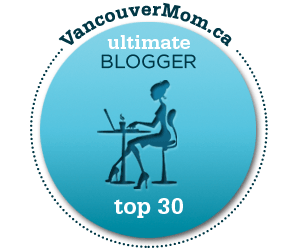 A great big thanks to VancouverMom.ca for selecting The Rock and Roll Mom as one of the Top 30 Vancouver Mom Bloggers. I started this blog because I love to write and everyday life just doesn’t provide enough opportunity for that creative outlet. Before I started the R&R Mom, you should have seen the notes I wrote to the Shorties’ teachers. Seriously, its amazing to me that all of you actually read what I write (and come back again to read more). Now to be honored by my fellow Vancouver Moms, its really kinda sweet. So thank YOU for clicking though and having a read (and I hope having a laugh here and there) and thank YOU VancouverMom.ca for caring enough to acknowledge the genre of Mom Blogs!